by Barry M. Warmkessel, Ph.D.
Vulcan is the distant, yet to be observed, dark star companion of the Sun. It has flavored our collective culture, sparked religious wars, aided in the manifestation of avatars like Christ and Buddha1 and stimulated quasi-periodic bombardment of Earth by comet strikes, redirecting the course of human civilization. Vulcan could be the Infrared Astronomical Satellite (IRAS) object discovered in 1983, or it could be within 15 degrees in right ascension and 9 degrees in declination of this object. This and other data have been utilized to determine Vulcan's mass and orbit. Our research paper entitled "Earth's Bleak Future" 2 estimates that Vulcan orbits the Sun in slightly less than 5,000 years in a very eccentric orbit that is highly inclined to the ecliptic plane. It is anticipated to be a Jovian-sized Protostar (called Vulcan by the Theosophists) 141 to 165 times Earth's mass, black or red in color and dense like Earth. Interestingly, Professor George Forbes arrived at a value of 5000 years for the period of an undetected planet in 1880. He used the aphelion (the point farthest from the Sun) of multiple long-period comets to predict an undiscovered planetary orbit similar to Vulcan's orbit in terms of period, inclination and node. It is important to note that the Vulcan Team does not suggest that the dark star comes anywhere near the inner solar system but, rather, it casts comets from the Kuiper Belt into near Earth orbits. Vulcan never gets closer to the Sun than about 2.7 times as far as Pluto's farthest point. Our online paper entitled "Vulcan, Comets and the Impending Catastrophe" 5 indicates that Earth is vulnerable to quasi-periodic comet bombardment. These giant comets sometimes fragment while rounding the Sun and form comet swarms that pass through the inner solar system, some impacting Earth. Long-period comets may have struck Earth approximately 5,200 and 11,600 years ago, causing Noah's flood and our current warm interglacial period, respectively. The latter date coincides with Plato's date for the destruction of Atlantis. Sir Fred Hoyle, Britain's recently deceased royal astronomer, postulated that meteor strikes averaging 10,000 years apart are responsible for initiating and terminating Ice Ages. Warm interglacial intervals, lasting about 10,000 years, are found interspersed in the Ice Ages. This interval is loosely related to comet impacts when Vulcan is near aphelion; specifically, it is related to both the location of Vulcan and the periodicity of the Vulcan-induced comet swarms. "Earth's Bleak Future"2 explores geo-climatological data (resulting from past comet impacts) over the past 14,000 years and correlates it with quasi-periodic impact intervals predicted by our theoretical estimates of Vulcan's mass and orbit. Vulcan's orbital period (and eccentricity) can also be independently calculated from this data. The combined analysis indicates that Vulcan's period is between 4969 (theoretical) and 4992 (geo-climatological) years. These procedures can also be used to approximately estimate when threatening comet swarms may next appear. Biblical sources (Matthew 24:21, Revelation 6:12-17, 8:5-13, 16:17-21 and 18:8-10,21 etc.) suggest that a smaller comet will impact a 'thousand years' (Revelation 20:1-6) before the final event. Unconventional sources indicate the probability of multiple comet strikes or near misses within the next 126 years. Two independent sources indicate that these events may start as early as 2006-2007, with other impact events following in the next 6 to 120 years. At most, a five-month visual warning is anticipated. Our research also postulates that extraterrestrials (ET) would be keenly aware of Vulcan, and could even use its gravity to slow their spaceships' trajectory as they settle into an orbit within the solar system, and/or "sling-shot" their spacecraft homeward when they leave. Precise knowledge of Vulcan's mass and orbit would be required for such maneuvers. Crop Circle T367, which appeared near Cheesefoot Head in England in 1995 (image left), may represent an ET warning. The planets shown are disproportionately large but the orbits are to scale. The "small white spots" (four objects, one broken in two, totaling five) called "grapeshot" are depictions of meteors or comets. The "missing" Earth (its orbit is still depicted) signifies its devastation by the anticipated strikes. The relative locations of the planets and the precise location of their perihelion (closest orbital point to the Sun) define the date of this future event to within a few days. Dr. Robert H. Hadley, professor of physics and astronomy, analyzed this crop circle in detail in the winter 1995-96 issue of Colin Andrews' CPR International Newsletter. 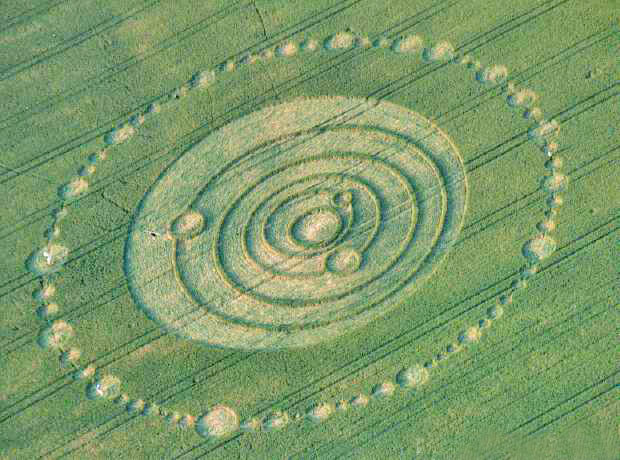 Dr. Hadley's analysis concludes that someone created this crop circle with precise knowledge of the solar system and with a skill that permitted it to be formed at an unusual hillside angle. This crop circle has another unusual feature: the Sun and planets are off-center. In our analysis, the center of the circle is defined by the cross hairs added to the crop circle image. The misalignment between the centroid and the Sun is presumed caused by the Sun-Vulcan center of mass. Assuming this circle defines the barycenter (center of mass) of the Sun-Vulcan binary system, it is offset toward IRAS 1732+239, an astronomical object that could be Vulcan. The "grapeshot" represents the incoming comet swarm originating from its resonant orbit position in Vulcan's orbit. The configuration of the inner planets represents a date when the threatening comet swarm may first appear. According to our analysis the comet cluster may first appear about 25 February 2007. The grapeshot indicates how many comets threaten Earth. The appearance of the comets will get our attention, but by then it would be too late to take effective countermeasures. Here, all the Hebrew letters found in a book in the Bible are strung without word or page breaks and rastered in 64 columns. A computer is used to search for words in a horizontal, vertical or diagonal format. Skip sequence words are searched (every other row or column is skipped) and viable words are found. Many skip codes exist, like 4, 10, 50, etc. Words cross other words or are found in the matrix vicinity of other words. It is postulated that these word groups are related. A variety of events are also revealed, including victories and defeats of political figures, assassinations, atomic holocausts, earthquakes and comet/asteroid strikes. President Clinton's election and the unexpected victory of Prime Minister Netanyahu were predicted. The "kicking out of a President" due to "Watergate" was revealed. Details of the assassinations of Yitzhak Rabin, Netanyahu (delayed), President Kennedy and R. F. Kennedy were found. Great earthquakes found in the Bible Code include the 1906 San Francisco quake, the 1976 China quake, the 1994 Los Angeles quake and the 1995 Kobe Japan quake. Earthquakes predicted include a 2010 Los Angeles quake, a Japan quake expected in 2000 and/or 2006, and a 2013 quake at an unspecified location. The Bible Code claims that an asteroid killed the dinosaurs (some now think multiple comet hits wiped them out). It also predicted the comet Shoemaker-Levy (SL9) would pound Jupiter on 16 July 1994. The Bible Code predicts that the Swift-Tuttle comet will re-appear in 2126, but will miss Earth because it "comes in the seventh month." In fact, the International Astronomical Union had issued a low-key warning of a potential collision between Swift-Tuttle and Earth based on its 2126 return. This warning was rescinded when new data indicated it would safely pass in late July, not mid-August as was first estimated. Long-period comet strikes are the important message of the Bible Code. An impact from a comet one kilometer in diameter would release a 300 Gigaton blast and create a tidal wave 300 feet high. Such a strike could annihilate the bulk of humanity by starvation via climate change. The climate could remain changed for millennia and the biosphere could be rendered temporarily acidic. Alexander Tollmann9 dates seven impacts to approximately 7910 and 7810 BC, when the celestial geometries between Vulcan and the Sun were much like they are now. This configuration moves the inner solar system farthest from the Sun-Vulcan barycenter. The theoretically projected impact dates are 2028 and 2128, with seven double-sourced predictions of impacts or near misses occurring about: 2006-7, 2011-13, 2015-16, 2030-31, 2044-45, 2071 and 2120-30. According to Bible Code, the first comet event occurs in 2006. Wars and economic crises relating to the strike follow. The Bible Code's 2006 event is proximate in time to the Crop Circle T367 event of February 2007. 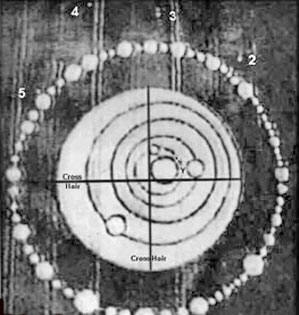 The T367 crop circle image shown here is believed to suggest the range and the date when the next threatening comet swarm first becomes visible, but it could also indicate when Earth (India?) may be hit. The Bible Code predicts that this comet will be crumbled as it passes around the Sun, as was the SL9 comet as it passed Jupiter. Many of SL9's fragments made spots on Jupiter larger than the Earth. One of the comets (#3 shown in Crop Circle T367) is a double, and perhaps has already been crumbled. Alternately, it may be crumbled in Earth's atmosphere. Another comet may cause tsunamis and fiery hail before and after its fragments strike the Mediterranean basin. One, according to Nostradamus, strikes the Aegean Sea off Evvoia destroying ancient Greek and Roman structures in the month of October shortly after the new millennium. This event is predicted for approximately 2015-2016. Zechariah 14:4 foretold an event causing a fracture extending from the Dead Sea to the Mediterranean, about 45 miles long. This comet could come from a northerly direction or out of the southeast going northwest if it rounds the Sun first. The shock of its passage through the atmosphere could produce large quantities of (sour) nitric acid, poisoning lakes and streams. The Israel meteorite seems to be one of about "super-tanker" size. A 500-meter fragment would make an impact site about a hundred miles wide. Israel would be thrice annihilated: by direct strike, tsunamis, and starvation (Isaiah 13:12 and Daniel 2:24-45). The real killer is predicted to be from a three-mile diameter comet that will produce a sixty-mile wide crater. Double sourced data suggest that it (and its fragments) will impact Canada, Ohio and/or New York around 2044-45 (other analysts suggest 2010-2013). It is believed that this impact will set off the Yellowstone super-volcano. Other impacts may follow, with coinciding predictions of 2120-2130, but humankind may be devastated by then. George Forbes was the first to predict hypothetical planetary orbits from the aphelion of trans-Neptunian comets in 1880. Forbes predicted a planet with orbital parameters similar to those of Vulcan's. He also predicted a planet at 87-122 AU with a 1,076-year orbit. In his 1994 book, ASTRO-METRICS, Yari Danjo1 predicted a planet he called Septimus at 154 AU. Perhaps the same planet, Danjo considered Septimus to be spawned by interaction between the Sun and Vulcan. His analysis indicated that Septimus is Earth-sized. Astronomer Clyde Tombaugh searched for these planets and concluded that none existed brighter than magnitude 16.5. By 1987, Van Flandern and Harrington suggested Planet X (Vulcan?) might be in a highly elliptical orbit. Several media releases between 1982-1987 suggested that the Sun has a dark star companion that causes periodic meteor bombardment of Earth. The IRAS search found three unknown objects but two may have been later identified (as gas clouds, galactic objects, etc.). (Nature, May 1984) Which two was not specified, but Vulcan is believed to be at or near one of these three: IRAS object 1732+239. The IRAS was placed in orbit in 1982, after Sir Fred Hoyle proposed in 1981 that meteor impacts cause Ice Ages. Surprisingly, he failed to consider that a distant planet in a highly elliptical orbit could cause frequent bombardment of Earth. Incidentally, the star map shown to Betty Hill 10 when taken on board a flying saucer in 1961 and Crop Circle T367 are not the only cases where extraterrestrials have provided evidence of the solar system's dark star. An unpublished case occurred on 6 October 1974, when an individual was invited to board an ET craft and seemed to know a little of astronomical symbols. He was not mesmerized, but remained lucid during the event and prepared a report afterwards. The ancients had descriptions of Vulcan and the comet swarms. 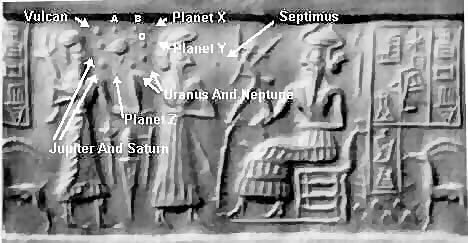 In The 12th Planet, Zecharia Sitchin displays a clay cylinder seal (VA/243) from the Akkadian civilization of Mesopotamia 4,500 years ago, showing globes of various sizes orbiting the Sun. What makes the Akkadian Seal so unique is that the sizes are given. There are three small planets representing Mercury, Venus and Mars (Earth and Moon are not shown). Shown are the Jovian planets with their diameters in scale to the logarithm of their known masses. Uranus and Neptune are depicted along with three larger planets, two of which represent Jupiter and Saturn. We interpret the more distant large planet to represent the dark star, Vulcan. Logarithms were unknown to the ancients, therefore, this data could only have come from an ET source. The mass depicted for Vulcan is consistent with the T367 Crop Circle barycenter and the quasi-periodic impact intervals found in Earth's geo-climatological history. Sitchin anticipates an object called Marduk in an elongated elliptical orbit reaching from deep space to the inner planets. Its 3,600-year period is close to our comet swarm's 3,313-year average period. We think the Babylonians knew of two comet clusters (within a comet swarm) and named them Marduk (a.k.a. Phaeton) and Tiamat. Marduk was recorded as a major astronomical entity with four "attendants" (five total, as depicted in Crop Circle T367) and Tiamat with eleven or more. An apparent "battle" occurred as Tiamat rounded the Sun and met incoming Marduk. A major comet, Kingu, is also shown. People living near Ardmarnoch in western Scotland may have seen this event about 10,000 years ago. They carved its (or Tiamat's) image on a large flat rock. Twenty-two comet-like objects are arranged in a cluster as if a comet had fragmented while passing around the Sun. European and Asia Minor traditions indicate that Marduk (and its debris) struck from out of the northwest (from Vulcan's aphelion). Persian (Zoroastrian) tradition claims that Tistrya (Phaeton) came out of the constellation Cancer. Three to five fragments struck the Earth in rapid succession: in northeastern Siberia (close to the mammoth graveyards), in Point Barrow and Harrison Bay, Alaska, and in the Old Crow Plains in Yukon, Canada. Huge hills of sub-fossilized and carbonized wood indicate that one strike was in the Arctic Ocean between Siberia and Alaska. The fragments may have reached the Carolinas. However, this may have been the result of an earlier strike that formed the Carolina bays and also left a large impact crater on the ocean floor near Bermuda. In his book, ICE: The Ultimate Human Catastrophe, Sir Fred Hoyle claimed that even a 300-meter meteor strike could initiate a worldwide Ice Age. Hoyle proposed that meteors (or comets) are responsible for both the rapid onset and termination of Ice Ages, as well as the variations of global ice levels found in the Ice Ages. Normally, the oceans act as a gigantic heat engine, forming water vapor that moves north and south with the winds. When it rains or snows, heat is released, warming the mid-latitudes. Stony meteorites are five to ten times more common than metal ones. A meteorite more than 300 meters in size would throw a thousand times its mass into the high atmosphere. Half-micron sized debris could remain aloft for over ten years, causing the oceans to cool and lose their reserves of heat. Fine ice crystals, which naturally form when temperatures drop below minus 40º C, would no longer be held at bay by heat rising from the Earth. They would reflect much of the Sun's radiation back into space causing the Earth to remain suspended in an Ice Age. Less frequently, iron meteor strikes form heat-absorbing metallic dust that prevents the fine ice crystals from forming. The Earth would warm, signaling the start of an interglacial period. Such a strike would quickly melt ice and cause another catastrophe. Such an impact could be responsible for the extinction of 32 genera of mega fauna around 11,600 years ago at the end of the Ice Age. The rapid thaw melted the permafrost turning their tundra into a huge bog. This is why these giant mammals (e.g. wooly mammoths) are found buried upright. Well fed, they sank as the ground beneath them flooded and thawed. 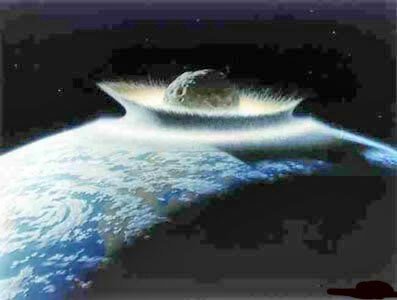 Hoyle's theory was criticized because geologists considered that the Ice Ages of the Pleistocene occurred on a regular or periodic basis, and Hoyle's proposed meteor strikes were expected to occur randomly. In truth, there may be nothing random about them. Geologists agree that glacial periods last about 100,000 years, whereas both interglacial periods and periodic fluctuations of temperature within the glacial period (bringing about the advance and retreat of glacial ice) each last about 10,000 years. NASA's David Morrison notes that the chance that civilization may sustain a serious meteor strike could be as high as 1 in 10,000. Some pre-historians think our current warm age will not last much longer. Christ acknowledged Noah's flood and associated it with fire and sulfur falling from the sky on Sodom. Curiously, Hoyle takes pains to extricate his theory from Noah's flood. He misdates it to 5,000 BC rather than to 3,000 BC, as do most theological sources. Hoyle also claims, without basis, that a cave (not an Ark) was involved. Was Hoyle apprised of a secret program, since he was the "ace" astronomer of the UK? Geologists cited in a book he references recorded a mini Ice Age about 5,300 years ago, near the anticipated date of the strike causing a worldwide flood. We think the Great Flood occurred 3195 BC based on matching theological and tree ring data. Researchers in Utrecht have identified six relatively recent magnetic "excursions" during which the magnetic pole moved a large distance (45 degrees or more) away from the geographical pole, and then returned. Each of these events lasted about 5,000 years (Vulcan's period). Magnetic excursions are failed attempts at magnetic reversal. When they occur, the strength of the magnetic field falls dramatically. Earth's magnetic field is currently diminishing and there is mounting evidence of increased aurora activity at lower latitudes. We think the magnetic field changes are related to Vulcan's aphelion and perihelion. According to Hoyle, the change from Ice Age to warm age took only a decade. This must have proven nearly as disastrous for humans as for the mega fauna that were driven to extinction. Reversals of the Earth's magnetic field when Vulcan is near aphelion could cause penetration of high-energy ions from the Van Allen belts. These would produce biological mutations, new strains of bacteria and viruses, and the combined effects of chemical, nuclear and biological warfare. Strike data from ancient cultures have been recorded worldwide. Allan and Delair in When the Earth Nearly Died have catalogued over five hundred legends depicting this catastrophe. The most popular topic in ancient legends is the deluge, but in many the deluge occurs after a conflagration or firestorm. When mentioned in pairs, the firestorm precedes the deluge, and the water extinguishes it. Also mentioned is ice hail, rains of blood and solid material (like stones), as well as tsunamis and boiling lakes and rivers. The average date of this event, derived from all sources, is 11,581 years ago. A sea of crystal - the comets' debris fields - preceded the comet Phaeton. They fell first and kept falling even after the comet's main body impacted. Raindrops ranging from the size of a man's head to that of a wigwam were reported, as well as 50 kg. ice hail. Frozen gases (dry ice) could fall into bodies of water and give the appearance of boiling. Bones of late Pleistocene animals encountered in drift deposits are frequently iron stained. Bone breccias are often strongly ferruginous and silicified. This material may have come from the debris field, or the main body of the comet itself, or both. A metal core comet striking the Earth would inject large amounts of metal dust into the stratosphere, creating a "sky of brass" and turning the icy tundra into a muddy swamp. These legends support Fred Hoyle's theory that a metal meteorite caused the great mega fauna extinction circa 11,600 years ago. Both the Navajos and Choctaw, who are found in Arizona and Oklahoma respectively, tell tales of a giant tsunami. These areas are far inland, and it would take quite a tsunami to reach it. However, the American Indians were nomadic, and could have originally lived closer to the ocean. The Koran states that the wave bearing the Ark united with other waters from more southern latitudes. Can We Believe It? You Bet Your Life! Can this work dealing with the cyclic annihilation of mankind be taken seriously? All ET-related material is assumed not to be a hoax. The only measure of reasonability of "pseudo-science" data is its link to accepted data. Vulcan is linked to valid scientific data like the Akkadian seal, the IRAS search for a Protostar and the resulting IRAS object. It is also found in "pseudo-scientific" data like Betty Hill's star map, Crop Circle T367 and an unpublished ET description of the solar system. Vulcan's orbit was (partially) derived by Chinese astrological techniques, so it is considered a "pseudo-science" result. But it is linked to Forbes' hypothetical planet's orbit and geo-climatological data, both deduced by standard scientific methods. The comet's revisit cycle is linked to Vulcan's 5,000-year period and to the 10,000-year long interglacial periods (by a 3:2 orbit resonance). While the precise threatening impact dates are "pseudo-scientific" data, they fit within the mathematically projected window of a past impact event. Humankind may be so decimated by impacts in this century that we could not recover enough to survive the massive strikes predicted to follow in the next 1800 years.14 Those impacts will boil away the seas and reform the surface of the Earth. All life will be eradicated down to the last microbe. Given our leaders' deceptive nature, only the chosen elite will survive the impending impacts, thus eliminating the technological base required to impede the later threats. Human beings could end up viewing a "New Heaven and New Earth" (2 Peter 3:13 and Revelation 21) after incarnating in a new body type in a different solar system. 1. Danjo, Yari; ASTRO-METRICS of Undiscovered Planets and Intelligent Life Forms. Danjo's theory accurately predicts the orbits of solar planets and planets (and stars) in nearby star systems. Danjo postulates that the solar system was seeded and formed with the aid of a solar companion. We call it Vulcan because the Theosophist Madame Blavatsky called it Vulcan and taught us how to define its orbit. 2. See Earth's Bleak Future. 3. The Astrophysical Journal 290; L5 -L8, 1985 March. http://adsbit.harvard.edu/cgi-bin/nph-iarticle_query?1985 ApJ...290L...5Hname. 4. See www.barry.warmkessel.com/barry/2002Paper.html. Astronomical events relating to Jesus/Christ, Gutama/Buddha and the Dawn Of Mankind are defined. See www.cdi.org/russia/johnson/6018-7.cfm. Stars Aren't Smiling Down on 2002, according to Sergei Bezborodny, head of the astrology center at the Central House of the Russian Army. 6. What Would Happen if a Massive Oort Cloud Comet Strikes Earth? Answer: Venus. See http://personals.galaxyinternet.net/tunga/Venus.htm and http://csep10.phys.utk.edu/astr161/lect/venus/surface.html. 7. This theory is supported by ten substantial abduction cases, where ETs warned of an impending catastrophe. Six of these warnings indicated impending meteor or comet impacts. 11. See Current Evidence of Septimus' and Vulcan's Mass and Orbit, www.barry.warmkessel.com/barry/1999Paper.html#2, Figure 5A: An Extraterrestrial Alien Description of Our Alphabet and Solar System. 12. See Noah's Ark It's Geometry, and Noah's Vessel 24,000 Deadweight Tons. See also, Fasold, David, The Ark of Noah, 1988, and Ron Wyatt's www.arkdiscovery.com. 13. See www.barry.warmkessel.com/barry/8related.html#a and b for discussion of the impending change of Earth's magnetic field. See also, New Insight Into Earth's Magnetic Quirks, http://abob.libs.uga.edu/bobk/ccc/cc033099.html. "Did a Comet Swarm Kill the Dinosaurs?" Sky and Telescope, http://skyandtelescope.com/news/current/article_738_1.asp. Allan, D. S. and J. B. Delair; When The Earth Nearly Died: Compelling Evidence of a World Cataclysm 11,500 Years Ago, Gateway Books, 1994. Andrews, Colin. CPR International Newsletter, Autumn/Winter, 1995/1996, 1996/1997. The T367 crop circle was shown on Sightings, narrated by Peter Sorensen. See also www.vitalspark.org/vitalspark/210cc02.html. Beishline, Blackburn and Warmkessel. Dowsing For Extraterrestrials, American Association Of Dowsers, Fall 1995. Chapman, Clark and David Morrison, Cosmic Catastrophes, Perseus Publishing, 1989. Danjo, Yari; ASTRO-METRICS of Undiscovered Planets and Intelligent Life Forms, 1994. Drosnin, Michael. The Bible Code; Simon & Schuster, NY, 1997. Fasold, David, The Ark of Noah, Wynwood Press, New York, 1988. Forbes, George, On Comets, Proc. Royal Astronomical Society, Edinburgh. 1878. Hoyle, Sir Fred. ICE The Ultimate Human Catastrophe, Continuum Publishing, NY, 1981. Jenkins, John. Tzolkin: Visionary Perspectives and Calendar Studies. Borderline Sciences. 1994. Lindemann, Michael, Video. UFOs and The Global Situation; CNI NEWS. Pickering, William H. "A Search For A Planet Beyond Neptune." Annals of the Astronomical Observatory of Harvard College, Cambridge, MA. Sitchin, Zecharia. The 12th Planet, Avon reissue, 1999. Van Flandern, Tom. Dark Matter, Missing Planets & New Comets, North Atlantic Books, Berkeley, 1993.